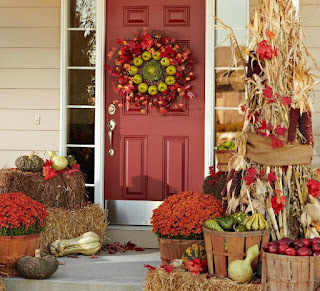 Make this the year you WOW everyone with your front door and/or your front porch .... go all out with these ideas while taking full advantage of nature's beautiful autumnal colors! 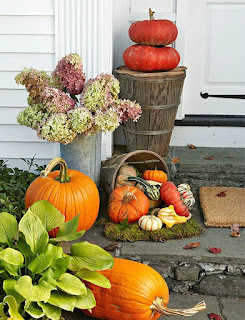 We love all that fall has to offer -- pumpkins, flowers, baskets, and leaves! No need to pick a favorite with this mix-and-match design featuring several pretty ideas: gourds pouring from an upturned basket, dried hydrangeas in a tin vase, and scattered leaves around the whole display. Carved pumpkins aren't limited to October 31. Turn a few pumpkins into bowls by cutting off the top and scooping out the insides. Use a pencil to trace a scallop design and carve. 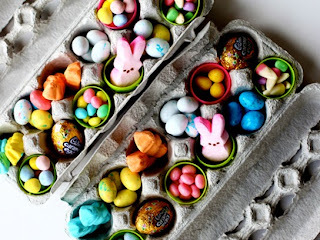 A power drill and drill bits make quick work of adding decorative circles. 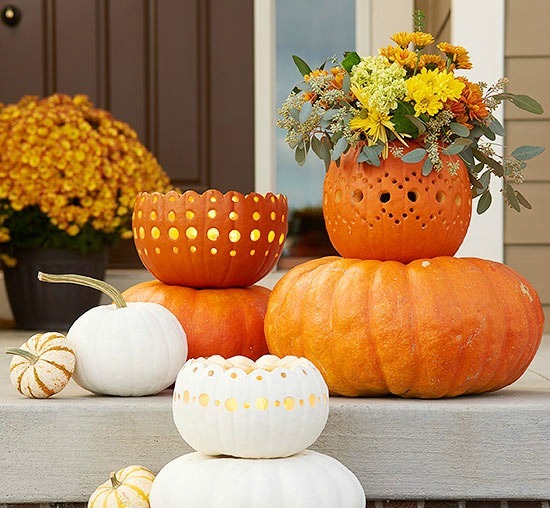 Place a vase of flowers in one pumpkin and candles in others. Display with squatty pumpkins with their stems cut off for optimal stacking potential. An autumn wreath featuring crisp green apples matches a porch full of fall flowers, gourds, and pumpkins. 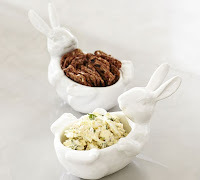 Hay bales and apple baskets let you play with the heights of your display. 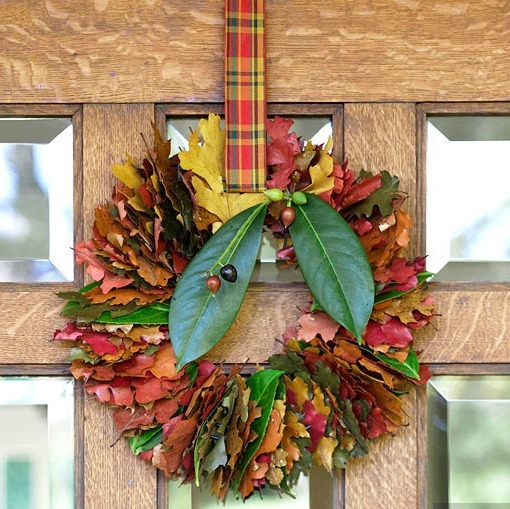 Pressed (or faux) leaves wired together in a small circle turn into beautiful front door decor. 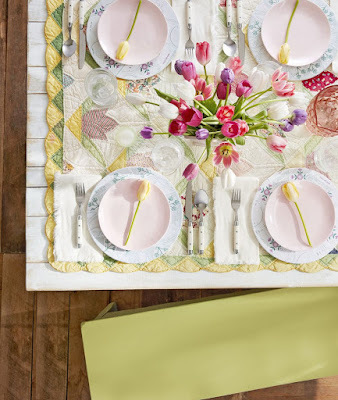 Suspend with a showy plaid ribbon. Let a vase of fall flowers do the decorative heavy lifting. 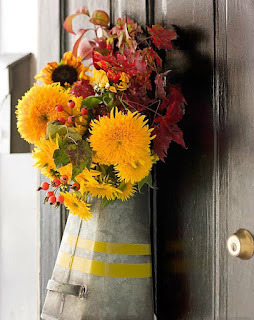 Pack "Teddy Bear" sunflowers in a watertight galvanized vase along with rose hips and maple leaves, then hang it from your front door. 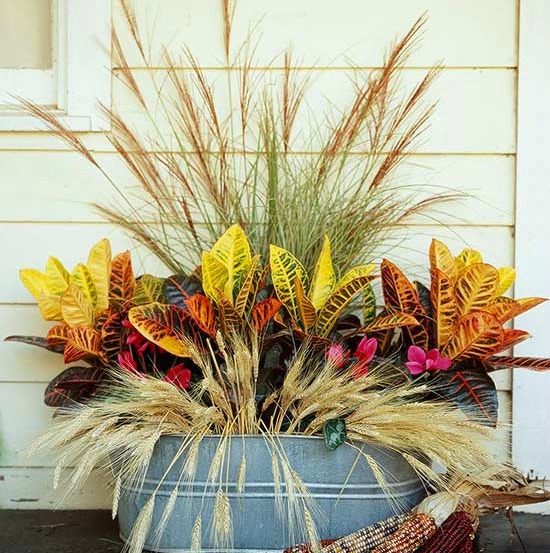 Show off your gardening prowess with a tin basin overflowing with fall finds. 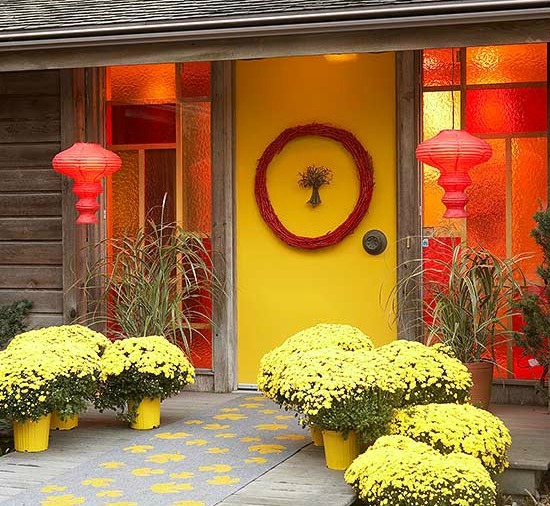 Set next to your door, it invites color and conversation. To make, place pots of croton shrubs in the center of the basin. Surround the front with droopy dried wheat, and fill the back with tall grasses. Lay dried Indian corn beside the display. The time-consuming part of this stunning display is the rug. Make your own stencil by tracing a shape onto poster board (we used several sizes of tulip poplar leaves). 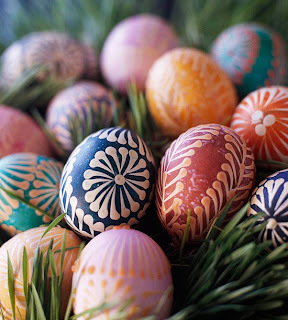 Cut out the stencil, place on an outdoor rug, and roll paint over your design. Remove the stencil and repeat. 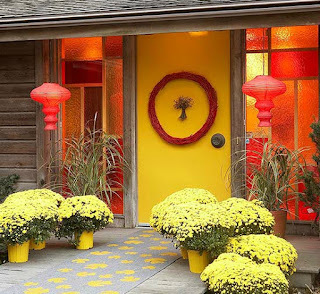 The rest of the fall entry comes together with potted yellow mums, hanging red lanterns, and a simple vine wreath. 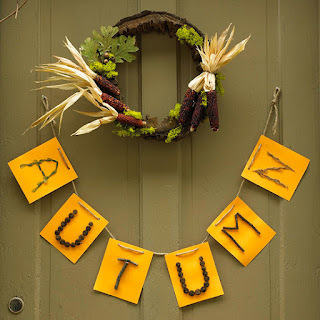 Make an Autumn (or Welcome) sign out of some twine and nuts or cuttings you find in your backyard. 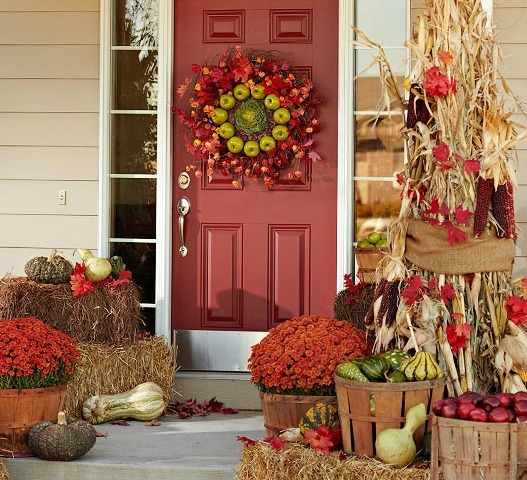 A small, simple wreath with decorative corn ears and greenery rounds out the decor.